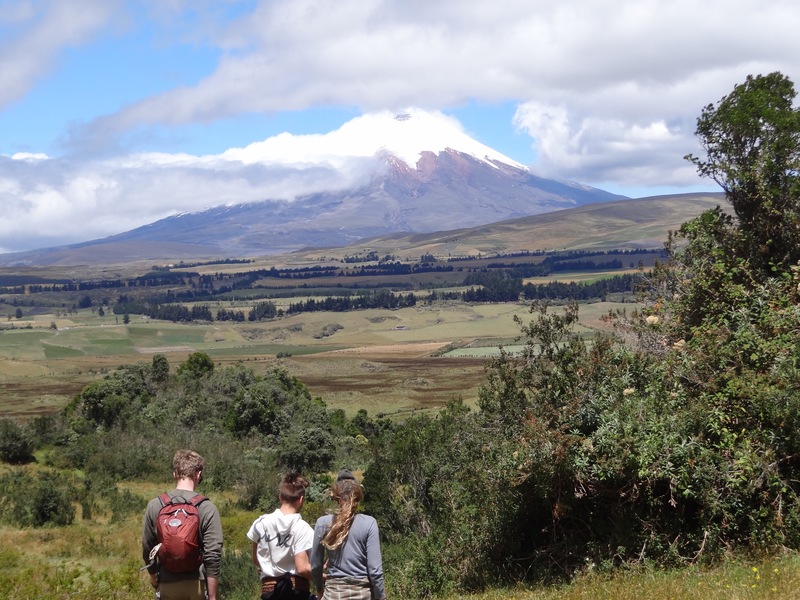 Perhaps the decision to spend 2 weeks at or below sea level (in the jungle) right before entering Cotopaxi National Park (at 11,000 ft) wasn’t such a good idea. Trying to manipulate all the pieces to this puzzle of where and when to go to various places is challenged further by my complete lack of planning. In my real life, I plan everything down to the last ice cream detour. But in this life (which is no less real by the way), in this life I have dreamed for myself, I can only manage to plan about 12 hours in advance. There are way too many moving parts to know where I’ll be next week or next month. I’ve even had 2 occasions when I decided where I was going next the very morning that I needed to leave. So this brings me to the high altitude national park, named after the famous volcano. 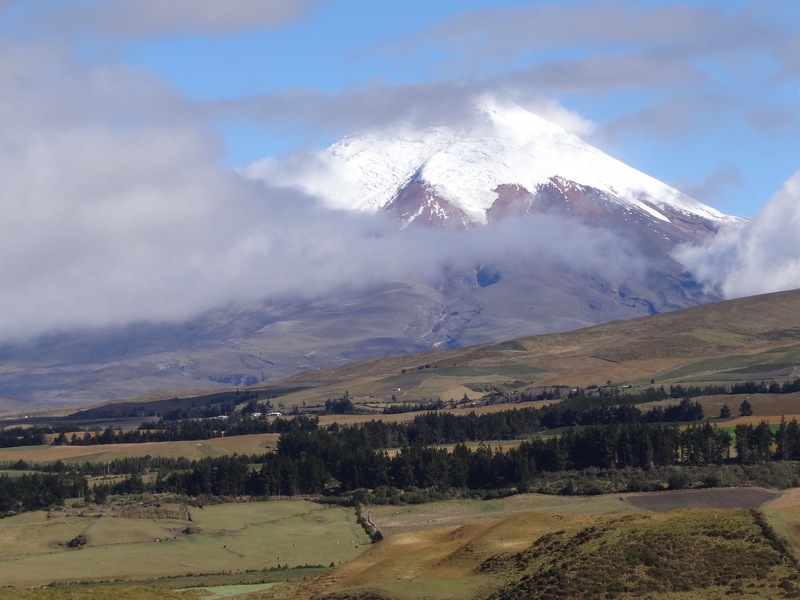 Several weeks before I was due to arrive in Ecuador, Volcan Cotopaxi was showing signs of activity. There was a thin line of smoke visible just from the tip of the cone and volcanologists had reported seismic activity in the area. Like Volcan Villarrica in Chile from earlier in my trip, this meant the park officials were beginning to limit tourism in the area. I thought I had wanted to climb all the way to the top, the summit just more than 19,000 feet. I climbed Mt Kilimanjaro (19,341 ft) in 2012 and I’ve often said that was the hardest thing I’ve ever done. 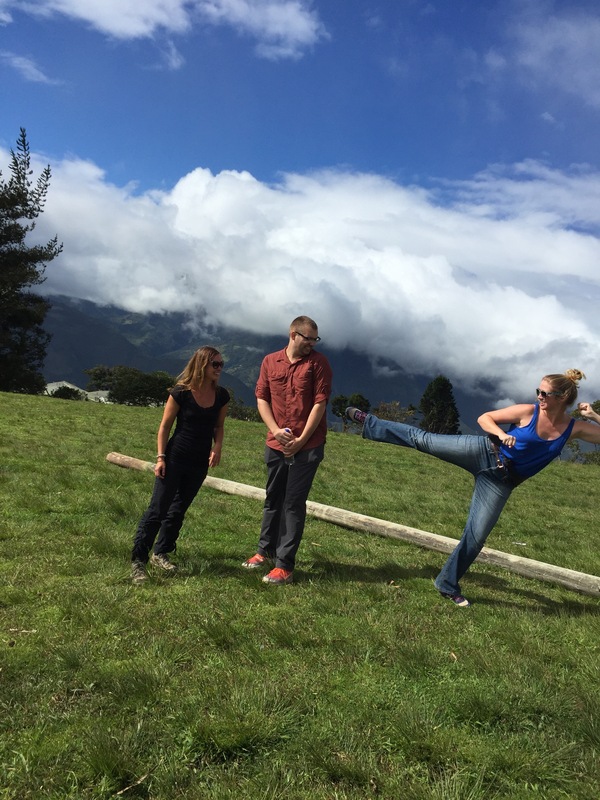 Climbing Kilimanjaro takes anywhere from 5-12 days, allowing time for acclimatization. 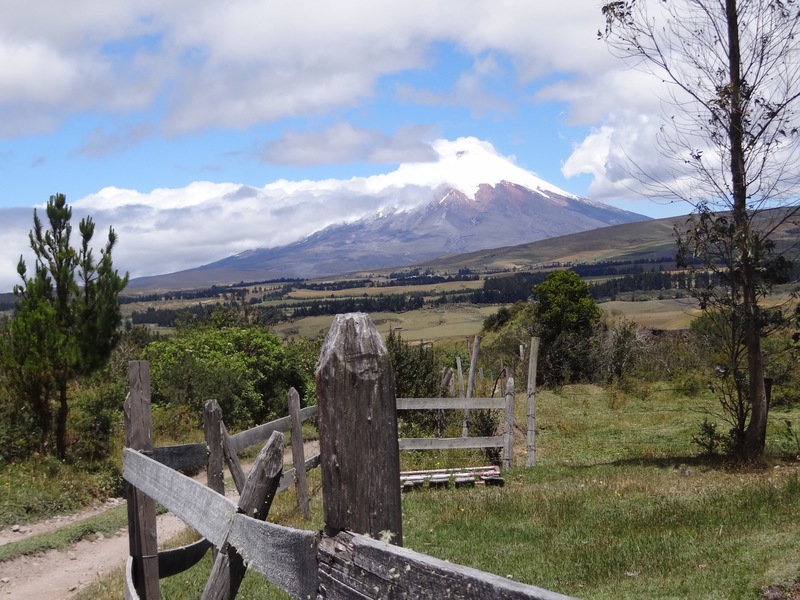 Climbing Cotopaxi is done in 2 days. Anyone see anything wrong with my idea? 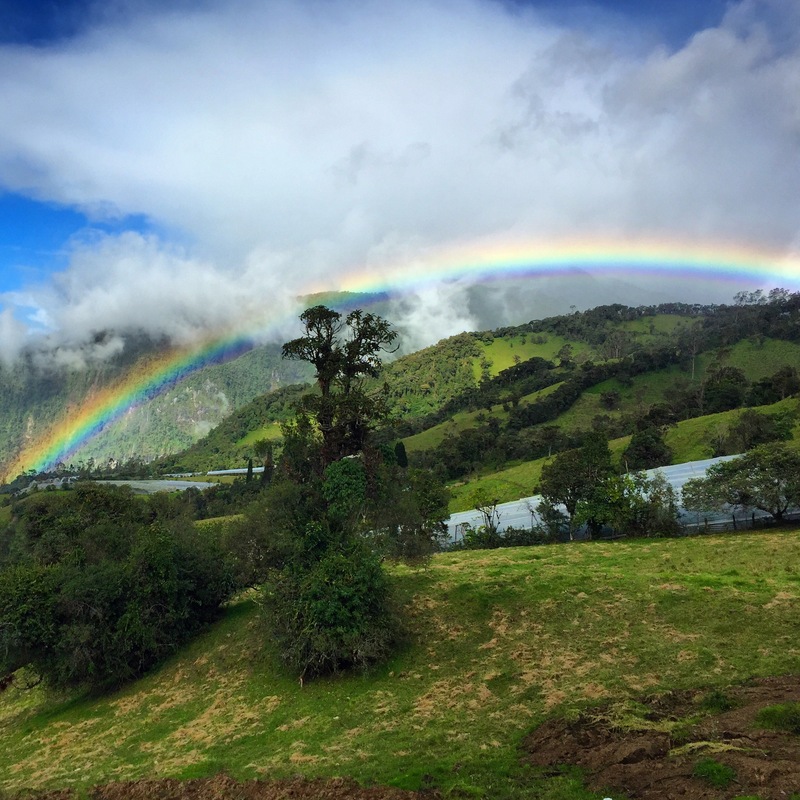 Assuming I was traveling at altitude in the Andes in the preceding weeks, it might have been possible, but I went to the Galapagos and Cuyabeno, effectively erasing any acclimatization I might have earned before. 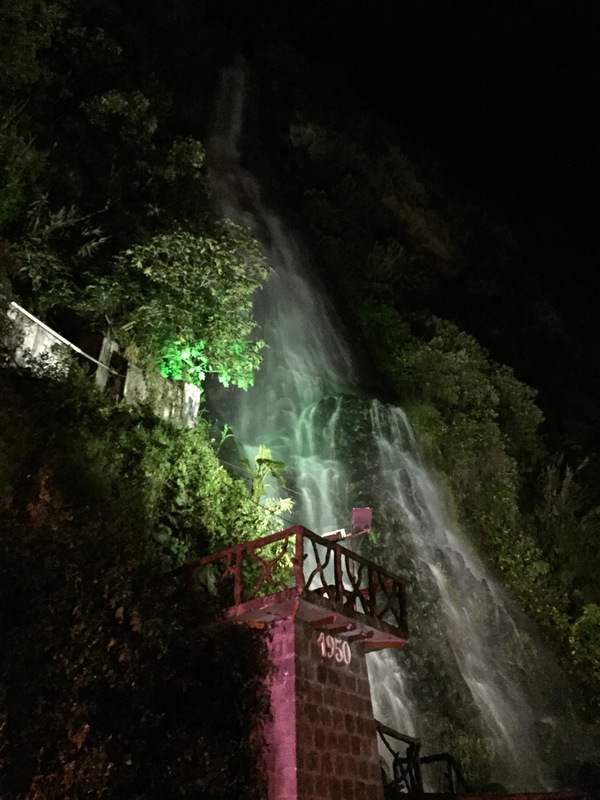 By the time I reached the park after a bumpy ride in a 4×4 from Quito, I knew that a summit attempt was out of the question. 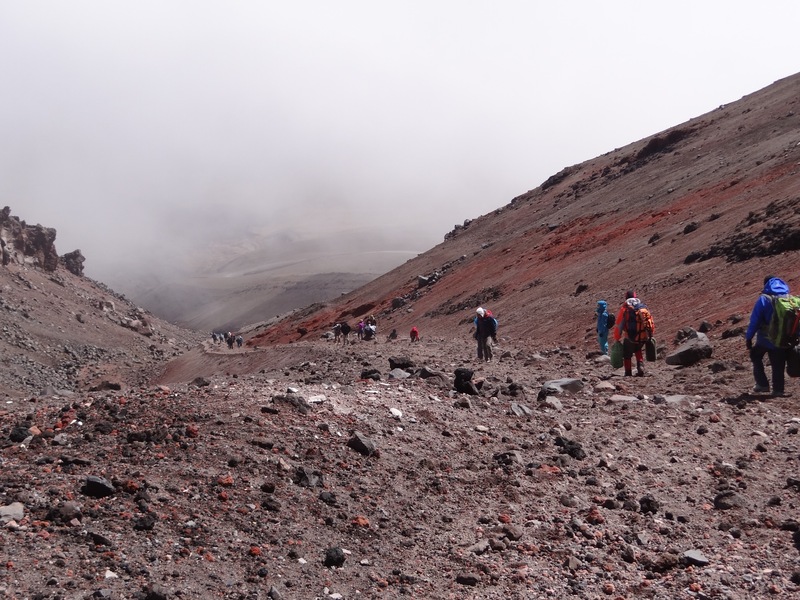 Even though the volcano was still smoking, the voracious park officials were still encouraging climbers to spend their dollars and climb to the top. The day I arrived 2 Canadian guys reached the summit amid a snowstorm and poor visibility. I, on the other hand, was already suffering from classic altitude symptoms. 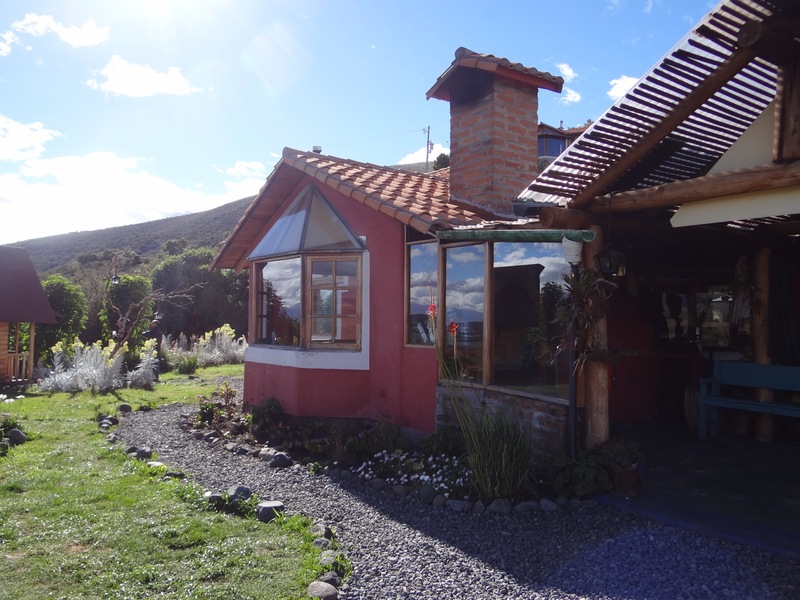 I was staying at The Secret Garden Cotopaxi, an eco-friendly hostel that is more similar to a bed and breakfast, with big cozy sofas in front of a wood-burning fireplace, several family dogs to snuggle with, and a big communal table for all of our meals. It’s not uncommon for travelers to stay there for weeks, perhaps joining the staff for work or just staying for the serene beauty of it all. The night I arrived there was a bonfire and live music, but usually it’s a quiet place to relax and enjoy nature. 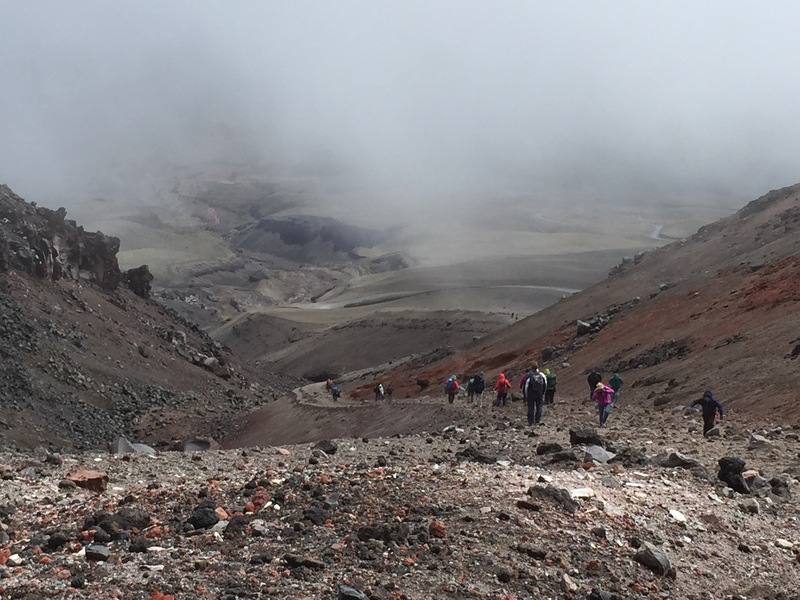 There are tons of hikes to do inside the park, most of them more beautiful than to climb on the volcano itself. But I’m stubborn. 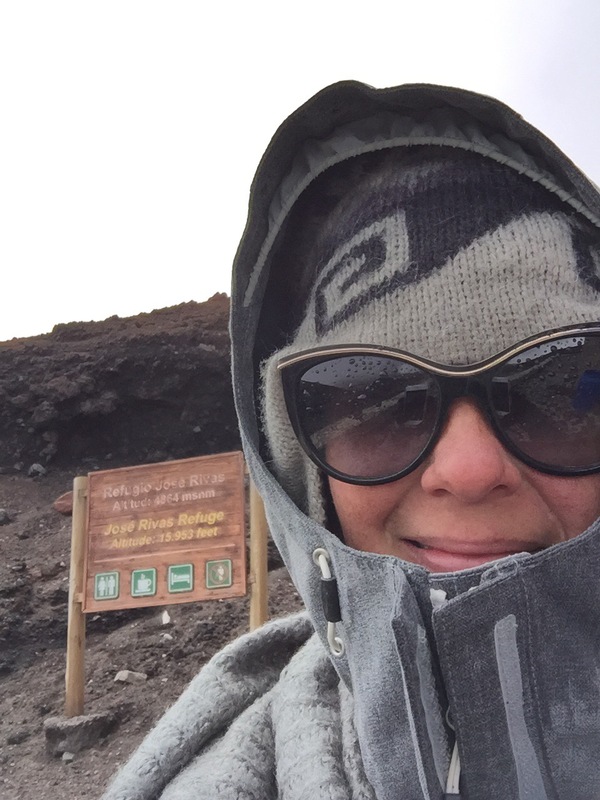 I came to walk on Cotopaxi. Even though I couldn’t go to the summit, it’s possible to be driven to the parking lot at 14,500 ft, hike first to the lodge at 15,900 ft for a break, then continue to the base of the glacier at 16,200 ft. Easy right? The whole circuit takes about 3 hours. Afterward, you can bike down from the parking lot, all the way to the entrance of the park. Whether it be 3 hours or 3 days, any sort of climb at altitude is taxing. This was no exception. The ground was loose volcanic rock that would slide when you stepped on it, so that you take one step forward and half a step back. Snow and ice pellets blew through the air – it was unclear if it was new precipitation or if the constant barrage of wind was blowing it from the ground. Most of the time, I couldn’t see anything more than 10 meters away, only snow and rocks. My flimsy cotton gloves were hardly sufficient. 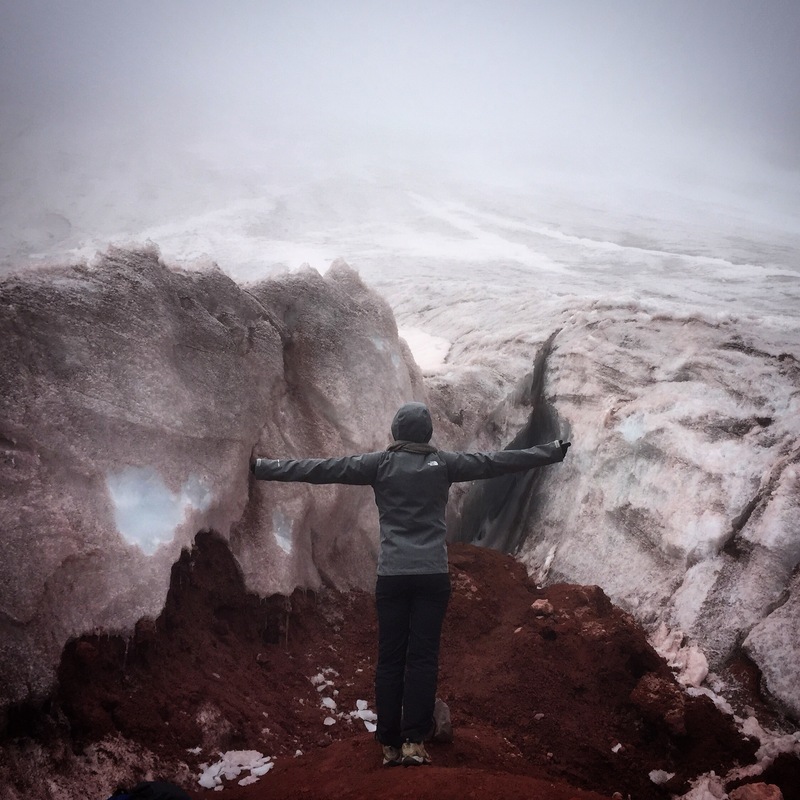 Upon reaching the glacier, I took a few hurried photos to remind myself not to do this again and jetted back to the car, well ahead of my guide and 3 other hikers. The downhill biking option that had sounded easy at the beginning of the day, was much less appealing when your fingers are frozen and you have dust in your throat and eyes. I opted out. Arriving back at The Secret Garden, it was a welcome retreat. An empty hammock and a healthy vegetarian lunch of Indian-spiced garbanzos awaited me. I quickly decided the view is much nicer when you’re holding a cup of warm coffee and reading a good book. 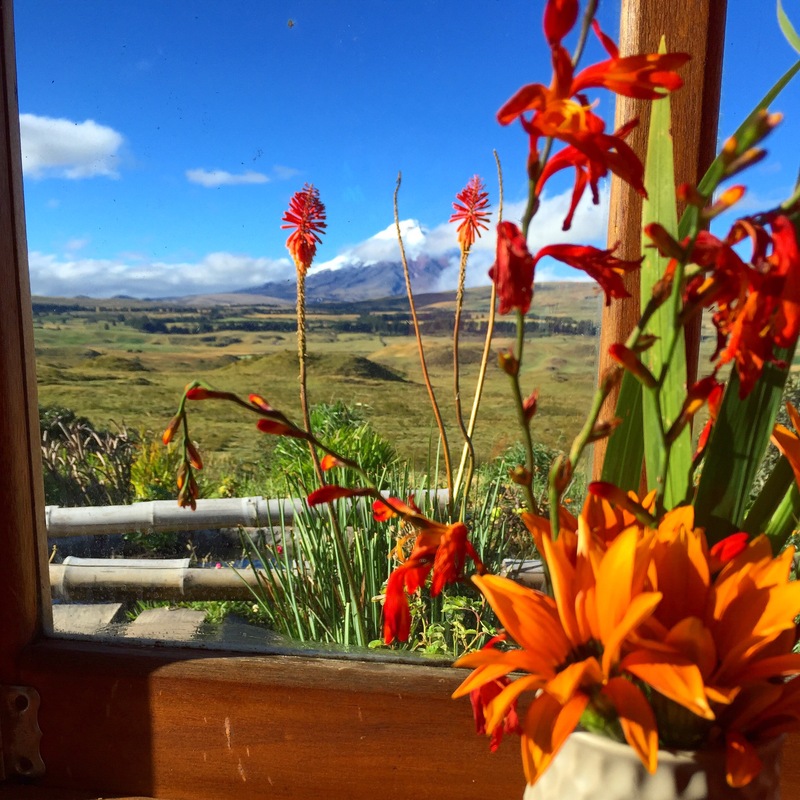 Less than 2 weeks after I stepped foot on Volcan Cotopaxi, on 14 August 2015, it erupted in a fiery display of magma and nature’s fury. Even today, the park remains closed to tourists. The Secret Garden lies just outside the park and is open for anyone wanting a panoramic view of the show. 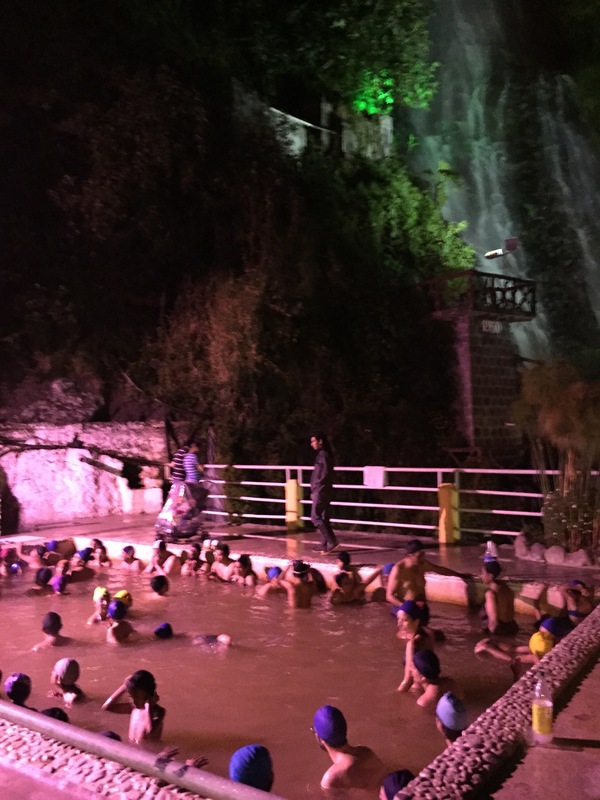 People often ask what my scariest moment in South America was. If you’ve never been there, you would probably expect me to say I was mugged or was mysteriously drugged and relieved of all my belongings. 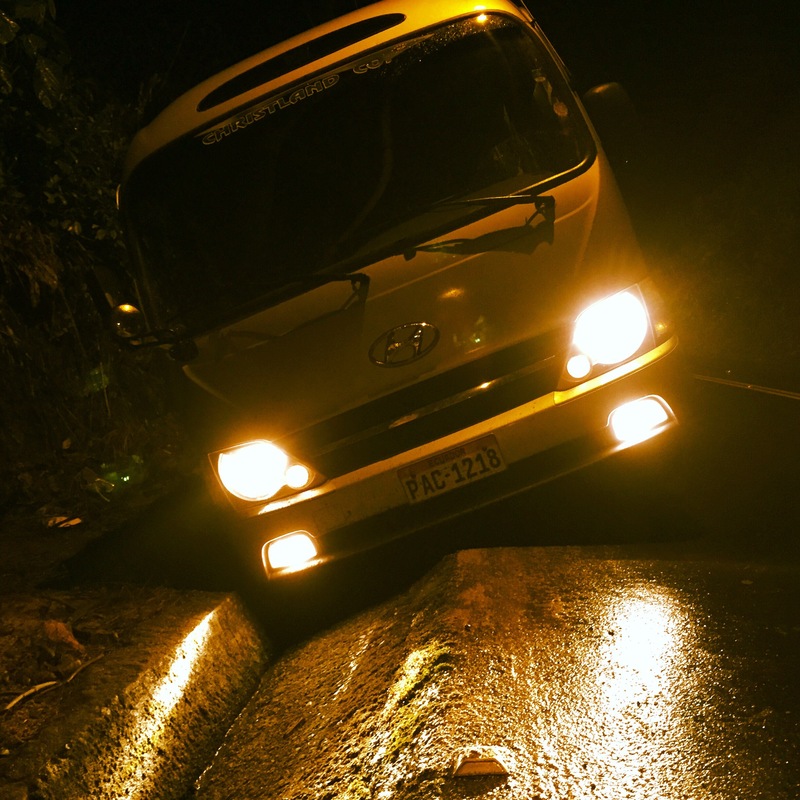 If you HAVE been there, you won’t be surprised that my scariest moment was a bus accident, the kind we all know can happen but secretly think it’s the sort of thing that happens to other people – the kind that happens at night, in the rain, going too fast, careening off the road. I was sitting immediately behind the driver and he had seemingly fallen asleep. Everyone awoke to a loud bang as we had drifted sideways into a ditch. The problem being that the minibus didn’t stop. We continued barreling down the ditch at a 45 degree angle, knowing we would either stop on our own or hit something and all 21 passengers had at least 5 seconds (a long time in a crisis!) to ponder how we were going to die. I don’t want to waste a lot of space writing about that awful night but I do believe all of us were extremely lucky to be spared without injury under the circumstances, the bus company (eventually) refunded our money and fired the driver, and I was left with the indelible emotional scar of a South American traveler. I really hate those buses. Well, where were we headed on that fateful night? Booked with various tour companies, all of the passengers on that bus were going to Lago Agrio in eastern Ecuador, the gateway to Ecuador’s primary rainforest. 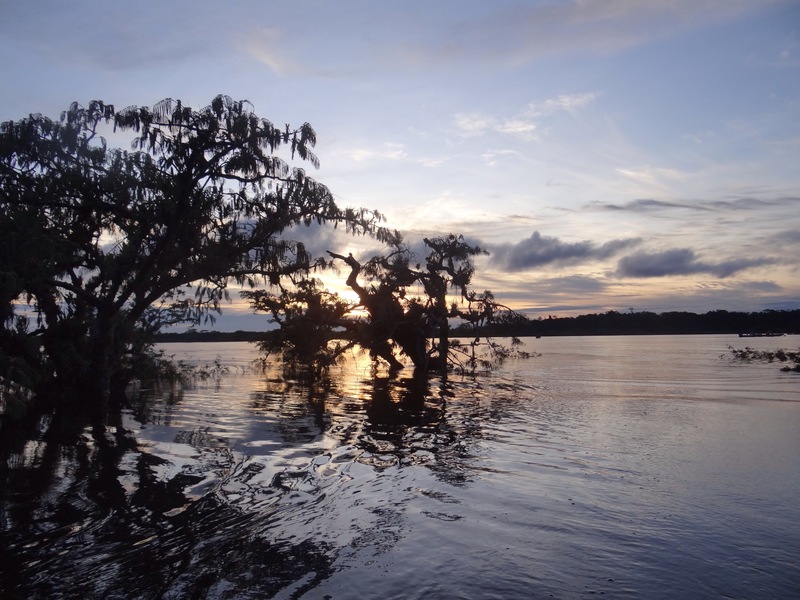 From Lago Agrio, we were separated into our various groups and sent further afield to Cuyabeno, a flooded plain with a diverse array of wildlife. 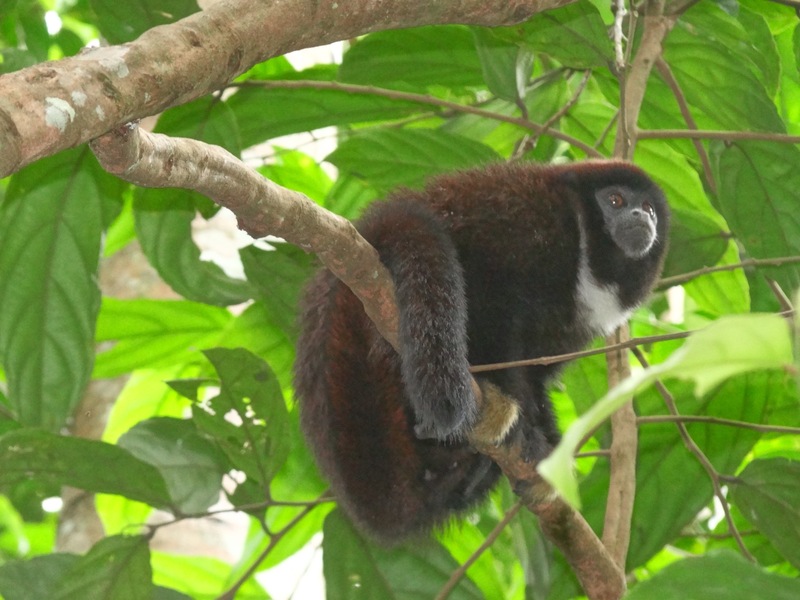 In 2010, I visited Manu National Park in southern Peru. It was incredible. 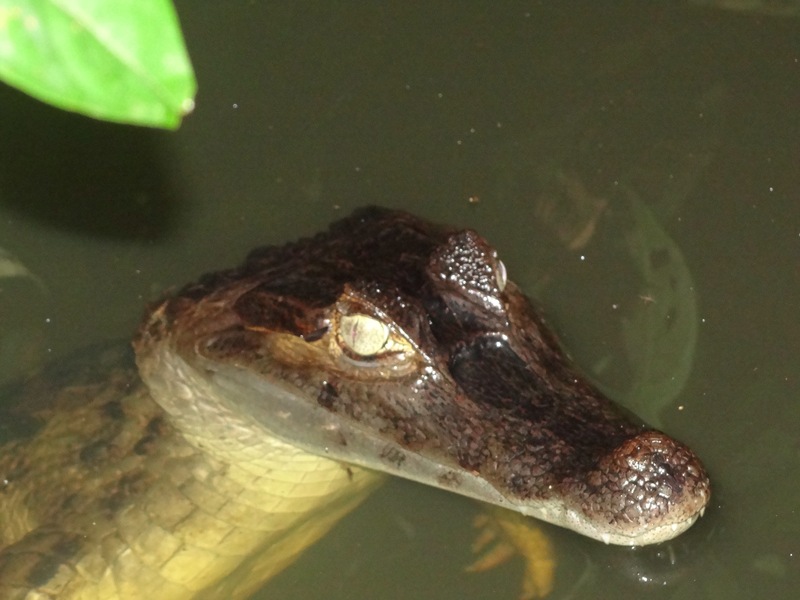 So incredible, in fact, that I wasn’t going to visit the Amazon this time because I thought it couldn’t be topped. 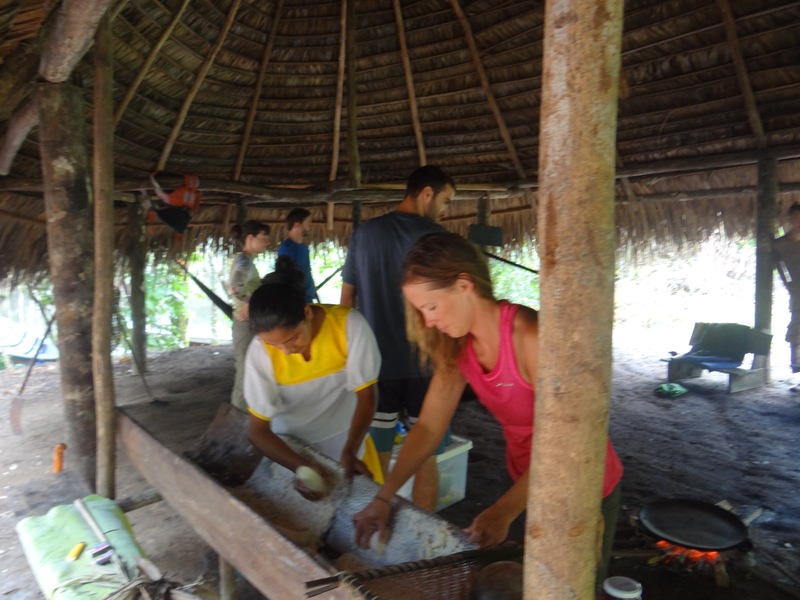 After I watched other friends take their jaunts into the jungle, I couldn’t not go again. 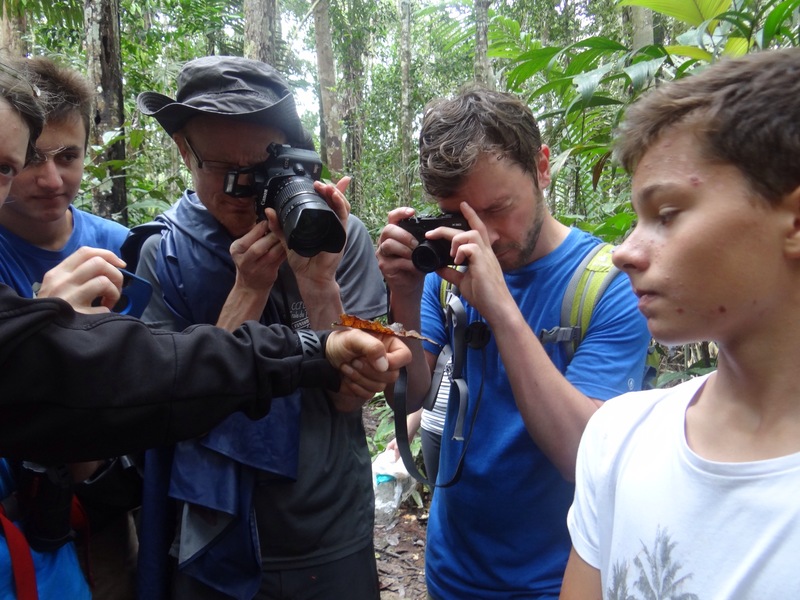 It’s that obligatory experience that you must have in South America, lest you miss a huge opportunity – to see the jungle while you still can. 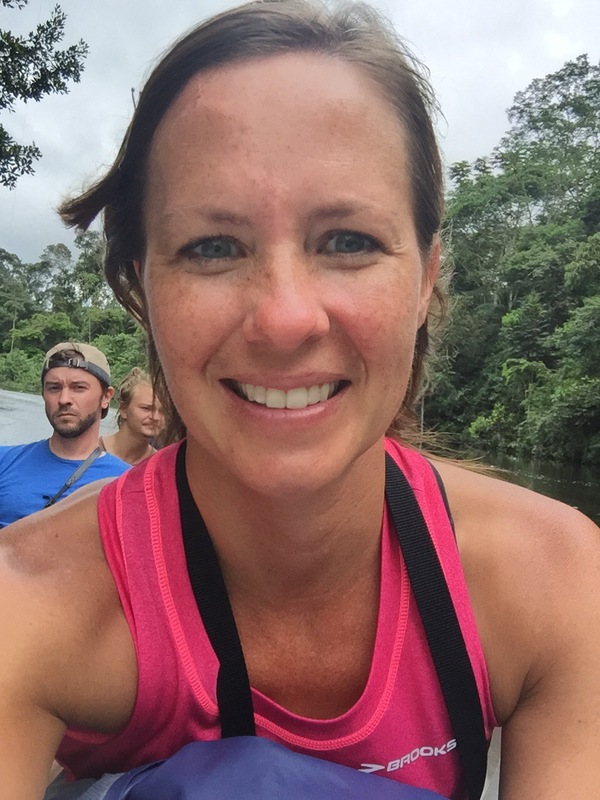 Our travels into the jungle started with a motorized canoe upriver to Lago Cuyabeno, amongst dense forest that would envelop us each time we passed a bend in the river. 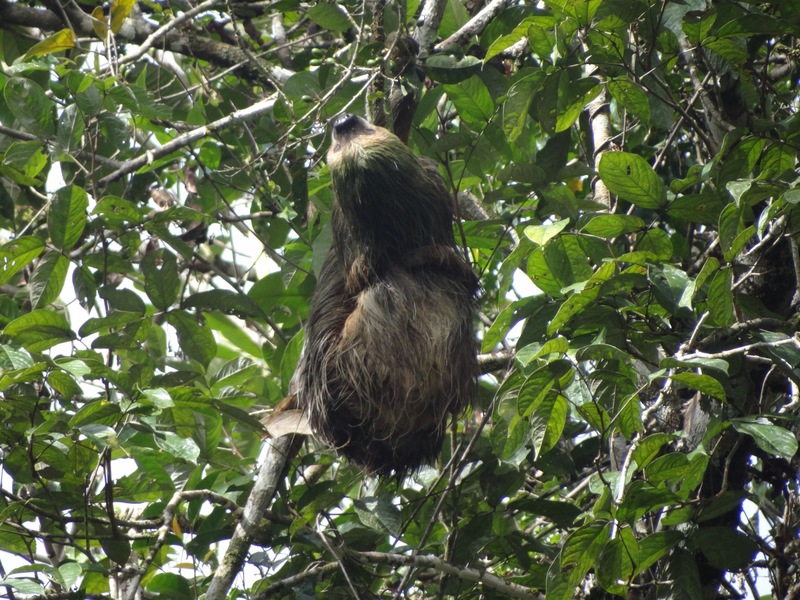 In the canoe, we had a rare opportunity to see a female sloth with her baby hanging about 50 meters up in a tree. 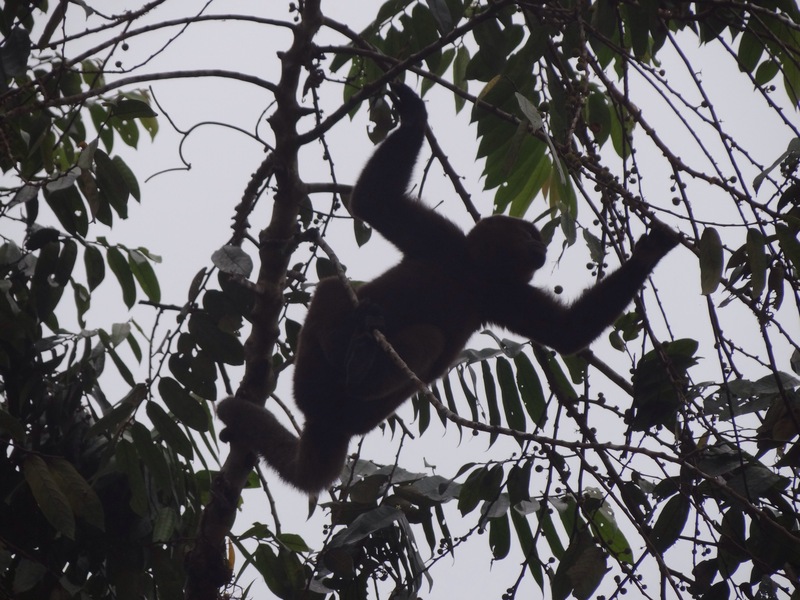 The mother hung on to the tallest branch with one hand, using the other hand to pick only the best tasting leaves for her dinner, while the baby had both arms wrapped around its mother in a grip that could not be broken. It’s true that sloths move at a pace almost slower than paint drying so it’s not hard to imagine they are easy prey for a predator. This is why they spend so much time so high up in trees, yet eagles have been known to take full advantage. 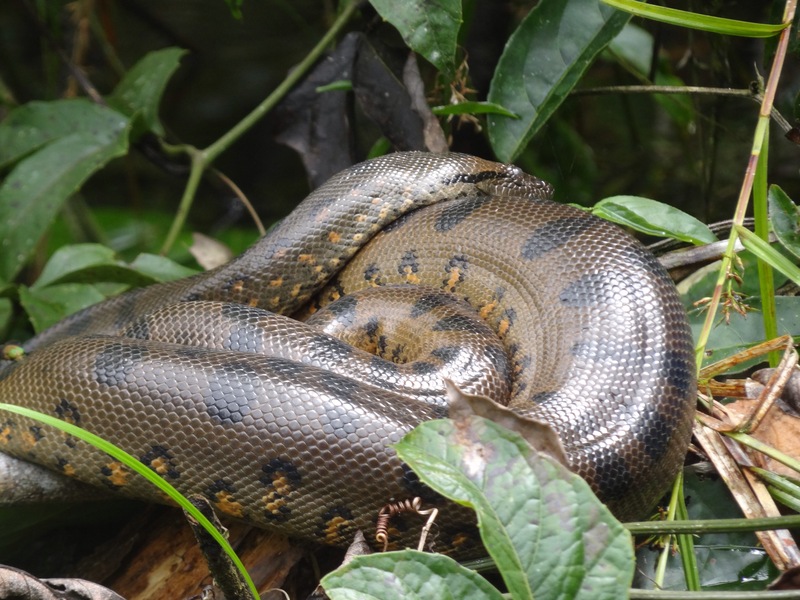 We also saw 3 species of monkeys on that first day and were just a few minutes too late to spot the queen of the jungle – the Giant Anaconda (an earlier group had scared her away). 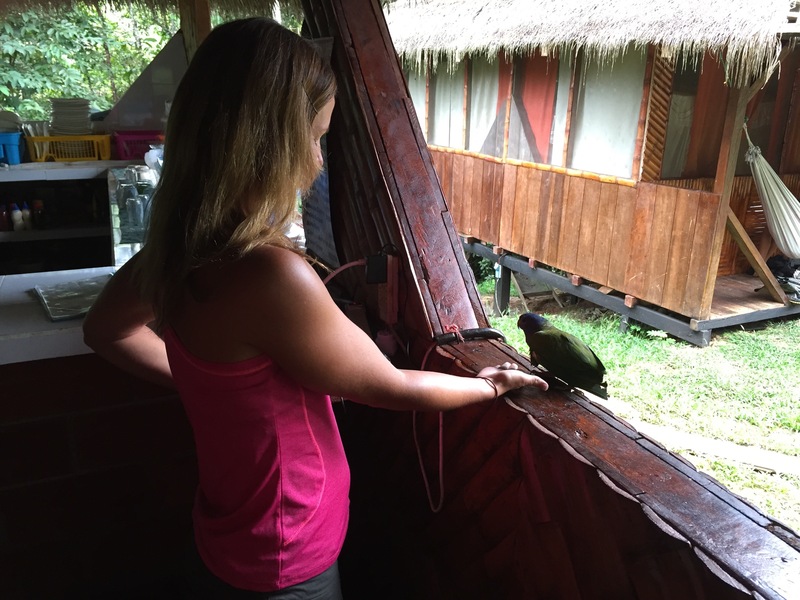 Our cosy accommodations, Caiman Lodge, were located on a narrow inlet from the main lake and had small rooms outfitted with screens instead of walls and beds covered by mosquito netting so that you could sleep listening to the sounds of the jungle. And that we did. 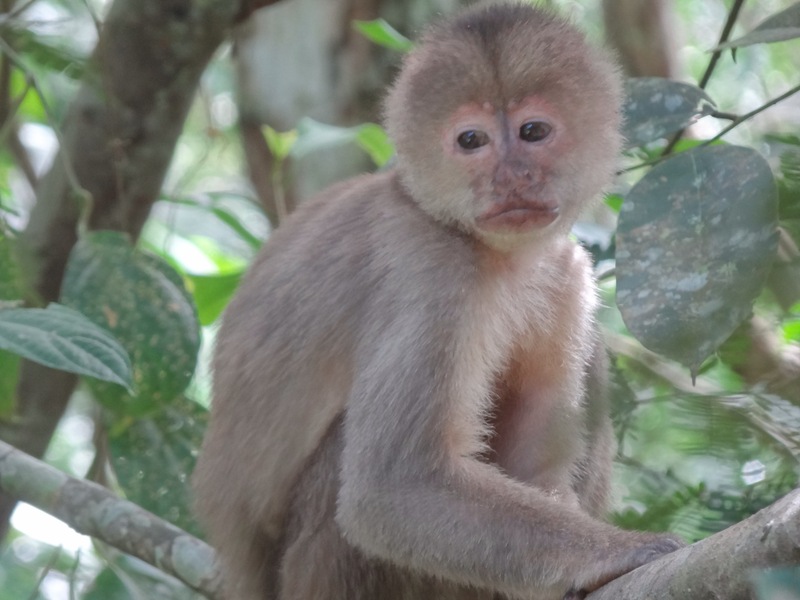 One night, I could hear capuchins noisily arguing over a banana outside my cabin. 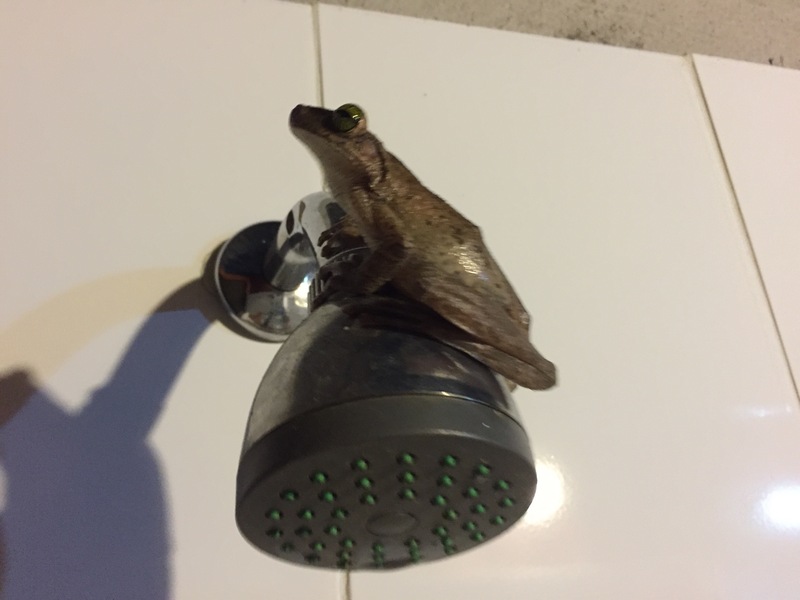 And in the morning, I found a frog perched on the shower head and I could see a pair of macaws resting within inches of my “window.” In fairness, one of these macaws had been injured when, a native who was trying to keep it as a pet, clipped its wings. 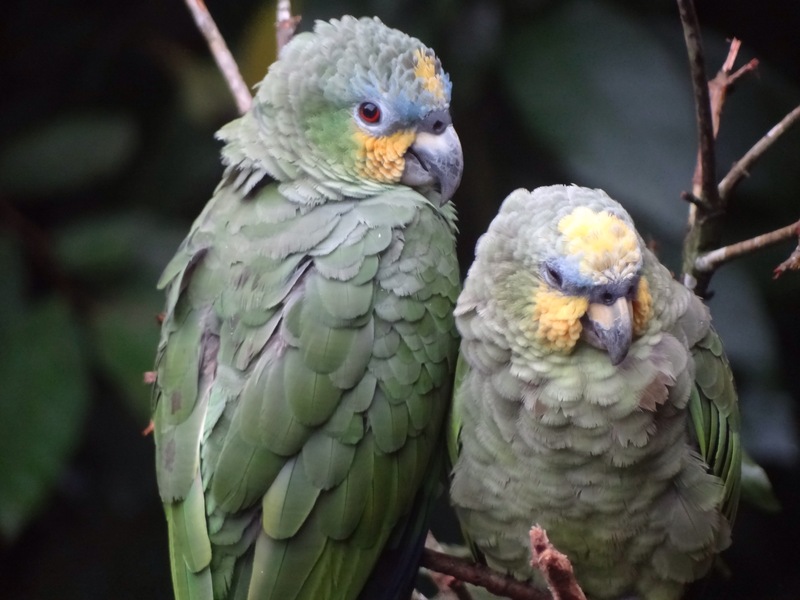 Because macaws have one mate for life, the other one stays with its partner even though it is able to leave. 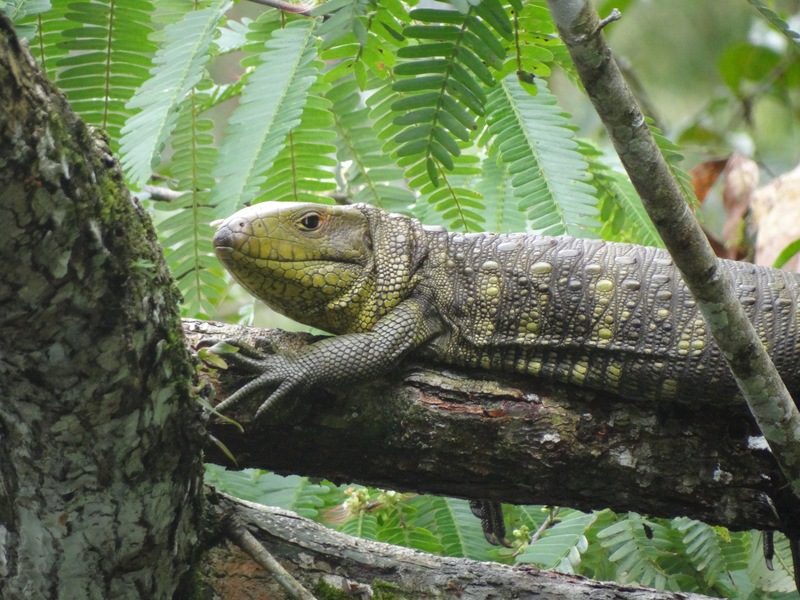 They never leave that tree and members of the kitchen staff at Caiman try to feed them leftover fruit when it’s available. 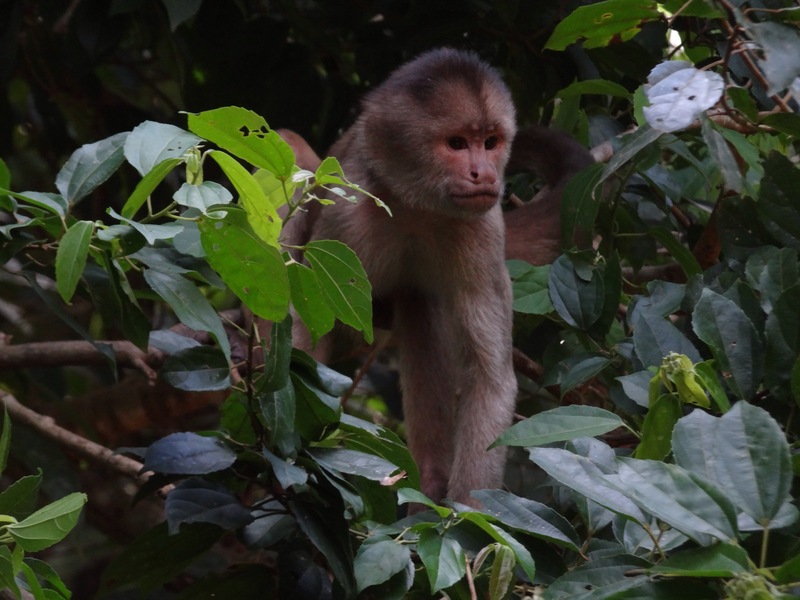 Conversely, the capuchins that live in the canopy are constantly sneaking into the open-air kitchen to steal fruit and it’s a routine battle of wills on who wins between the monkeys or the humans. The lake isn’t a real lake. It’s actually a flooded plain that never really drains because the rainy season has become longer year after year. Our guide, David, said that in previous times this whole area was dry enough that he could camp here. You can see the tops of trees, growing from seemingly nowhere, that have adapted to being mostly submerged. 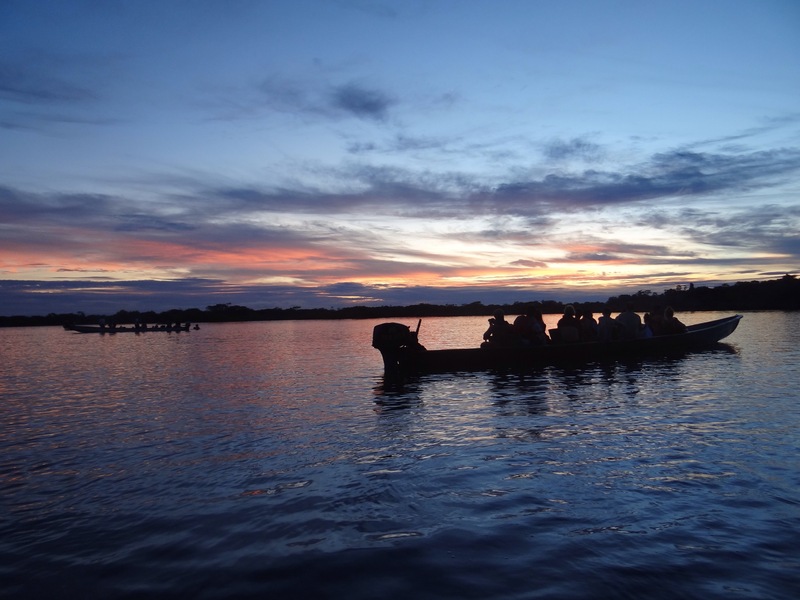 In this “lake,” you can find the Pink River Dolphin, if you’re lucky, and, on occasion, they will play games with the canoes. Try as we might, we couldn’t get the dolphins to pay much attention to us. They stayed hidden under the glassy surface, giving us only a glimpse of a mother and baby with only a mild amount of curiousity toward our presence. As the sun started to set, David gave the thumbs up to anyone that wanted to dive in. 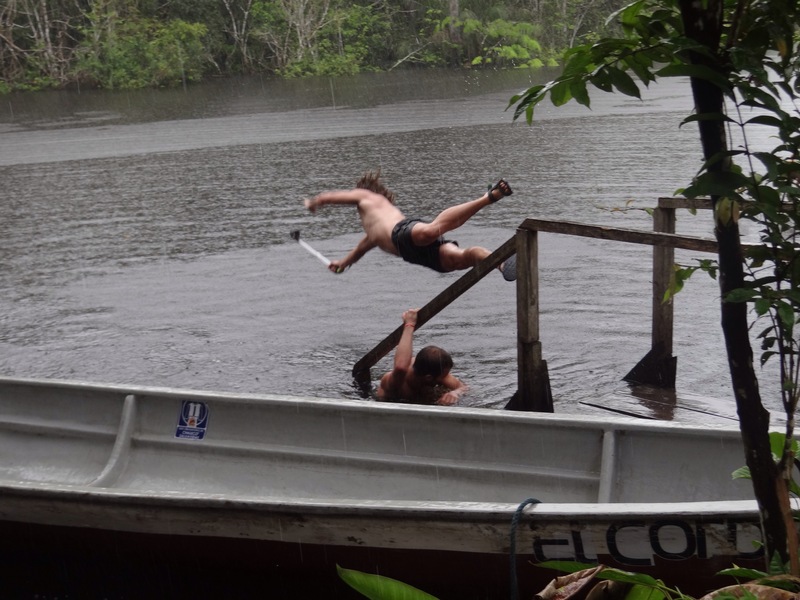 Two Canadian guys from our canoe, Connor and Sebastian, did simultaneous back flips into the murky water. 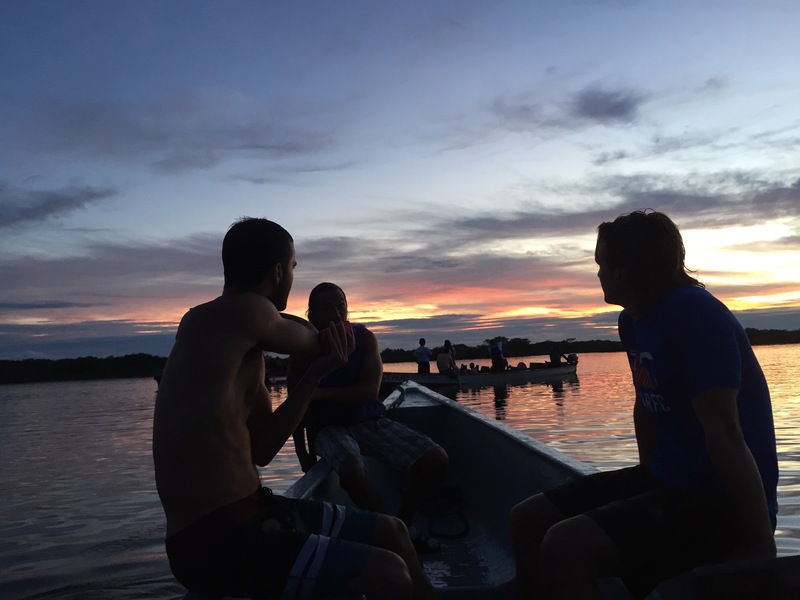 In this case, given the threats of anacondas, caimans, piranhas, and general invasive parasites, I kept myself safely inside the boat. 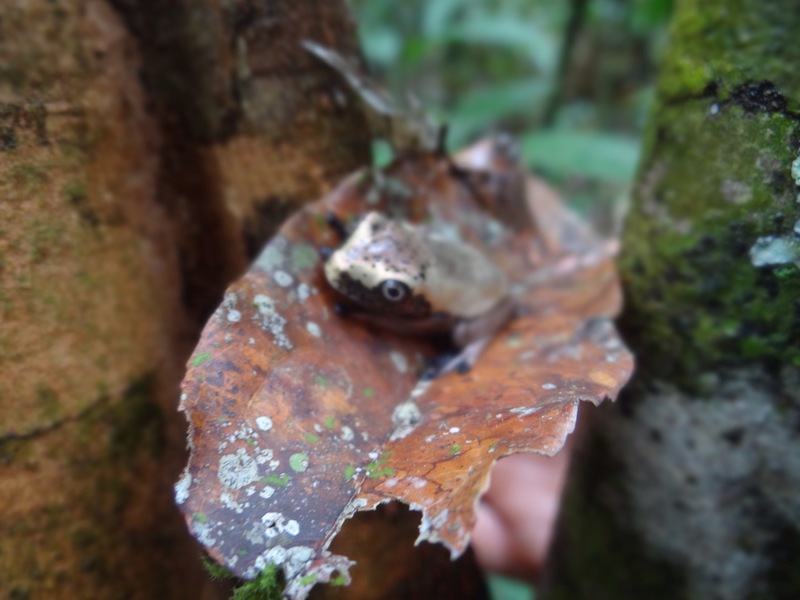 On one particularly muddy walk, we ventured inland to search for land-loving species. 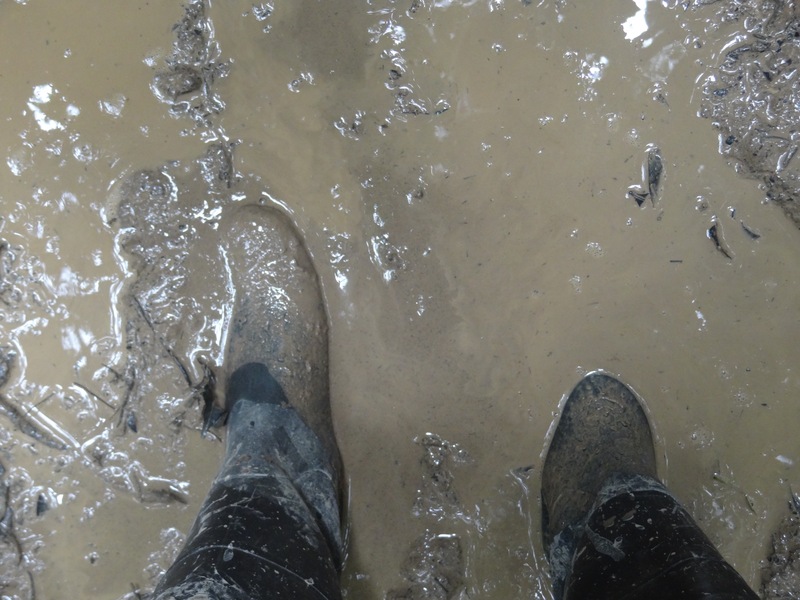 We were warned that we would have to traverse through a swamp so we were issued standard rubber galoshes to keep us dry. 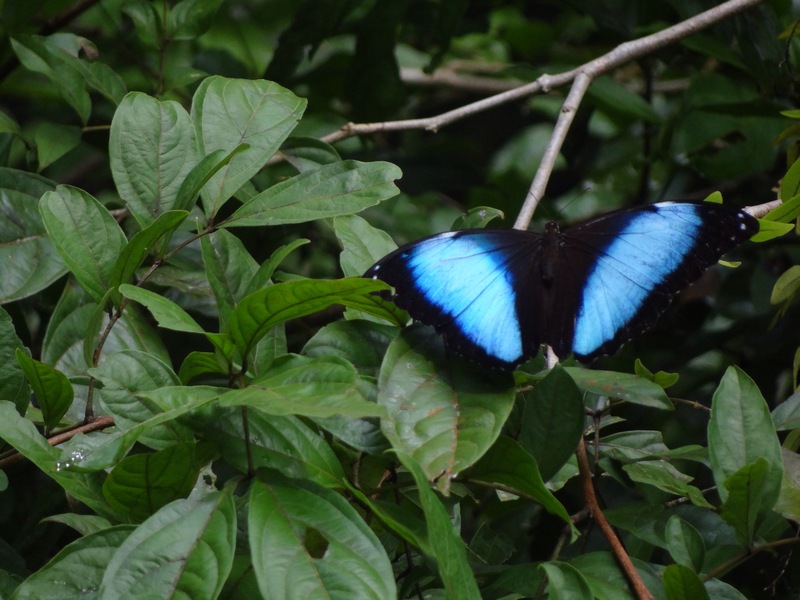 On the walk, we encountered unique Amazon species like the blue morph butterfly, a marmoset, and various birds and amphibians. Virtually everywhere you look, there is something alive and trying to blend in to its surroundings. 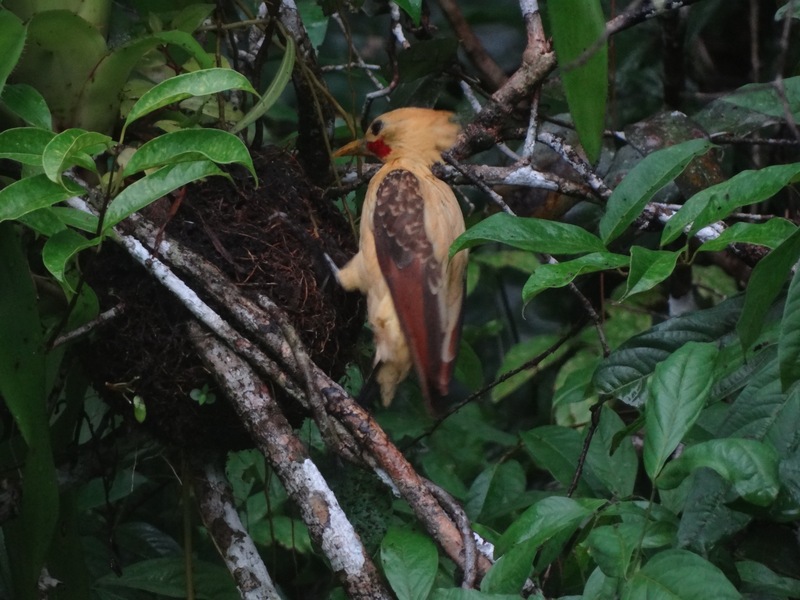 And the sounds of the jungle are just as vibrant – a hoot, a squeal, a cackle, a snort. To identify all of the sounds is impossible. 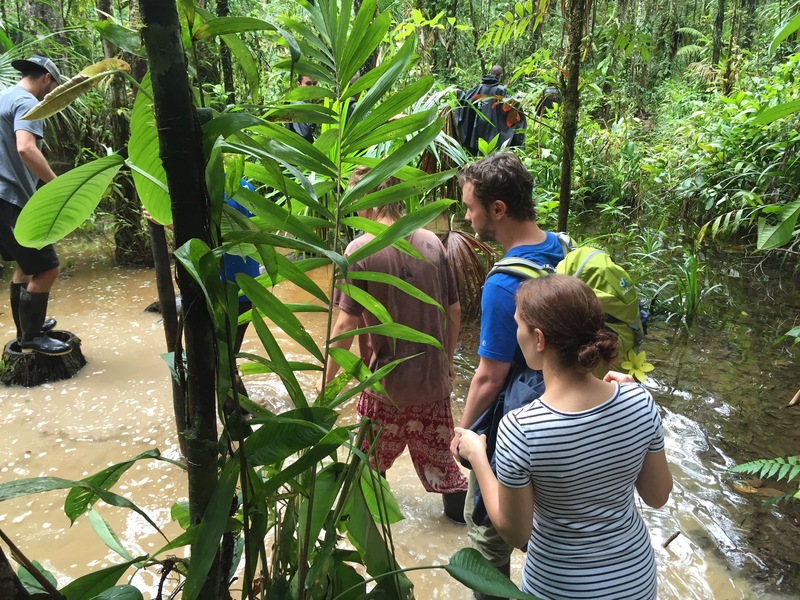 When we approached the swampy area, David began giving us instructions on how to walk without falling in the water. It seemed pretty easy in theory. You use your legs and walk right? Under the surface is a sludge of decomposing organic matter, tree roots, fallen trees, and, of course, lots of living creatures. There are a number of obstacles to cause you to trip or get stuck or bite you or just scare you half to death. It became obvious this was not a test of walking ability. It was an experiment in concentration, balance, and fearlessness. We had to trust the person in front of us to warn us about obstructions or, to the contrary, if there was something helpful like a firmly rooted tree to hang on to or a log under the water to walk on. Using a large stick for balance and for probing the ground for depth and consistency also proved necessary. 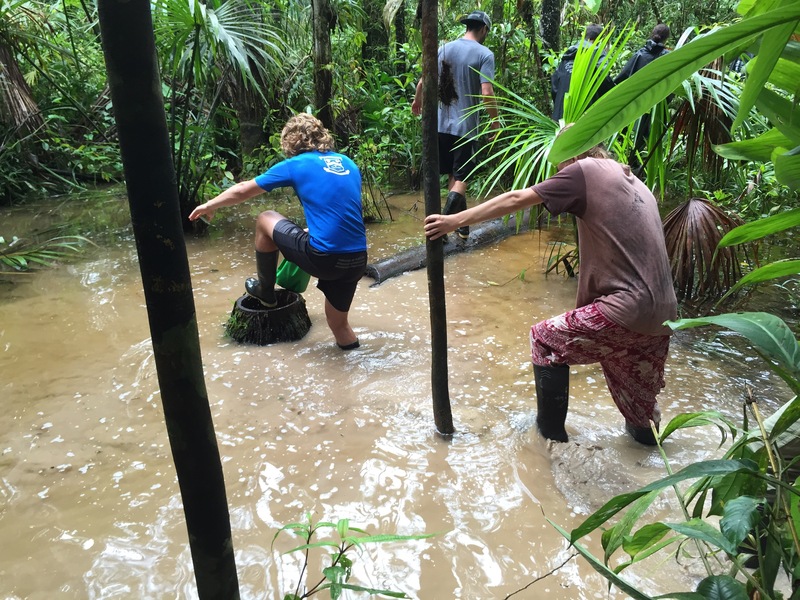 Half of the group had swamp water in their boots or had taken a slip at least waist deep. It took us nearly 30 minutes to cross about 50 meters and I was relieved to be done. 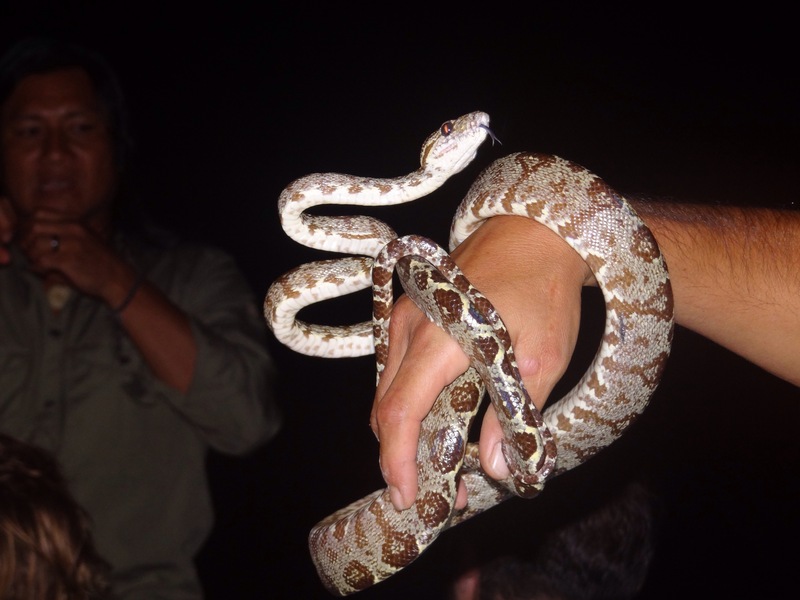 Not all creatures can be seen during the day so it’s compulsory to pair a day hike with a night walk as well. I have done enough night walks to know that this is when you see mostly spiders and insects. As an arachnophobe, I try to appreciate the spiders in their natural environment but I always make sure someone is walking ahead of me in case there is a large web across the path, I can let someone else walk into it before me. Sorry…but it’s the truth. 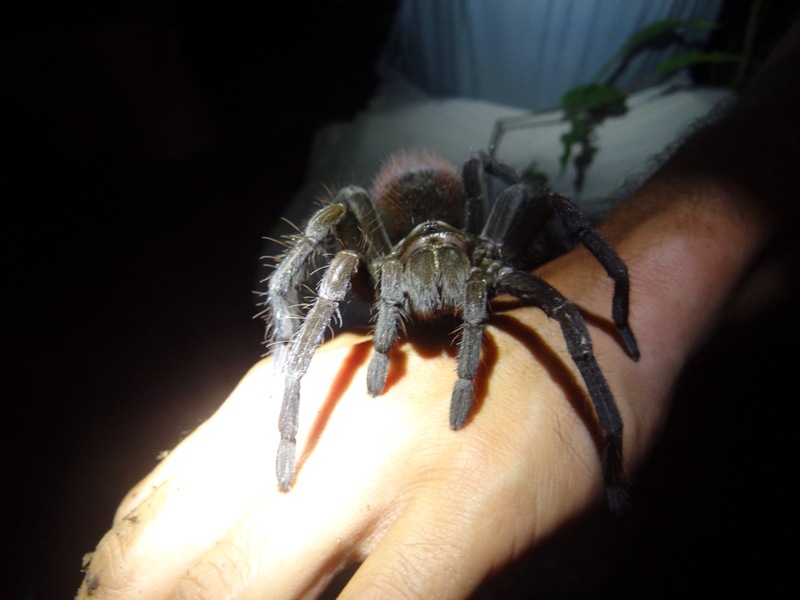 We were considered lucky to spot a tarantula and a boa and David was happy to handle them so we could get a closer look. 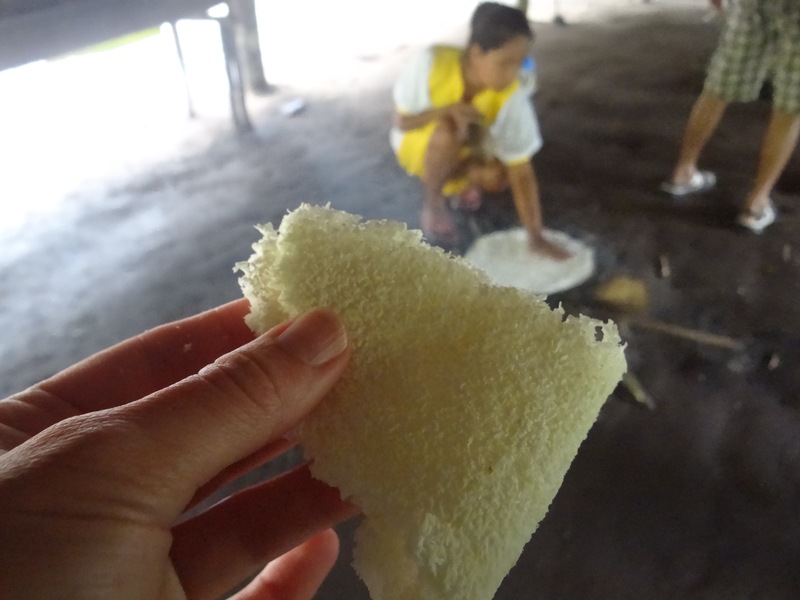 On a rainy afternoon, we traveled further into the rainforest to meet a shaman and make cassava bread with a local woman. We followed her to what looked like a mass of overgrown weeds and she began hacking at the roots with a machete. 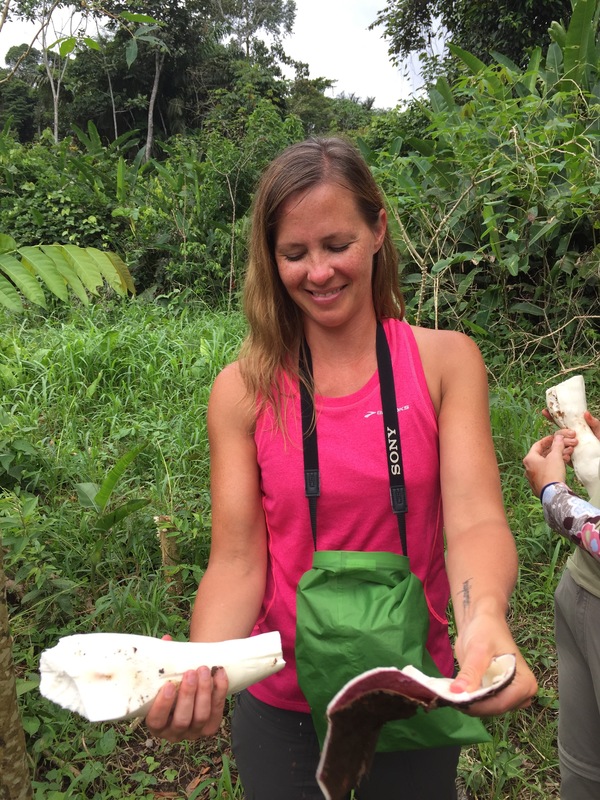 Using all of her strength, she pulled cassava out of the ground, one after another. We peeled and collected them in large mesh bags, carried back to her cooking shelter, washed, grated and cooked it for a nice snack with jam. It mostly tastes like nothing unless you put hot sauce or jam or SOMEthing on it, but it was fun to learn how to make it nevertheless. 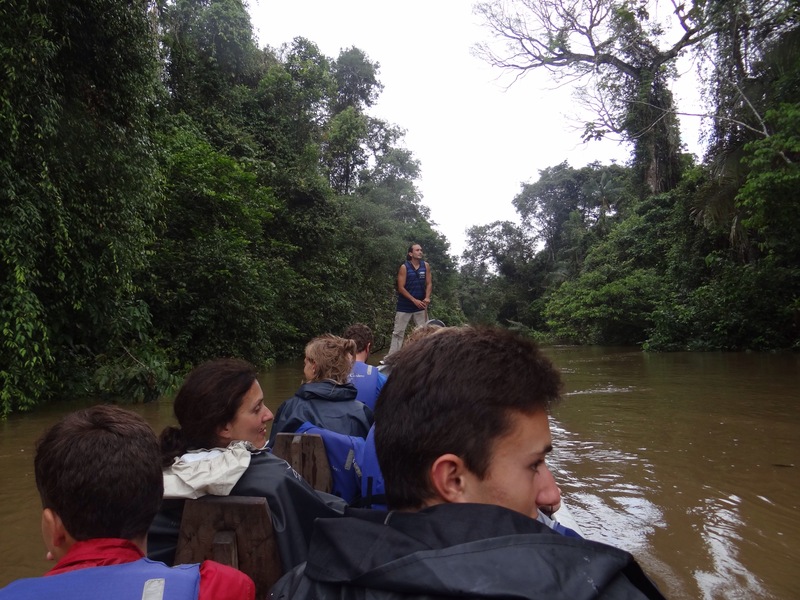 As a grand finale, on our way back to Caiman Lodge, David halted the canoe rather abruptly. He had spotted something shining in the sunlight. An adolescent giant anaconda, already larger than most snakes, was taking in the view. On our approach, she gave us a couple minutes to admire her presence before she retreated to the shadows. Again, I had experienced an incredible expedition into the jungle. Could it get any better than this? 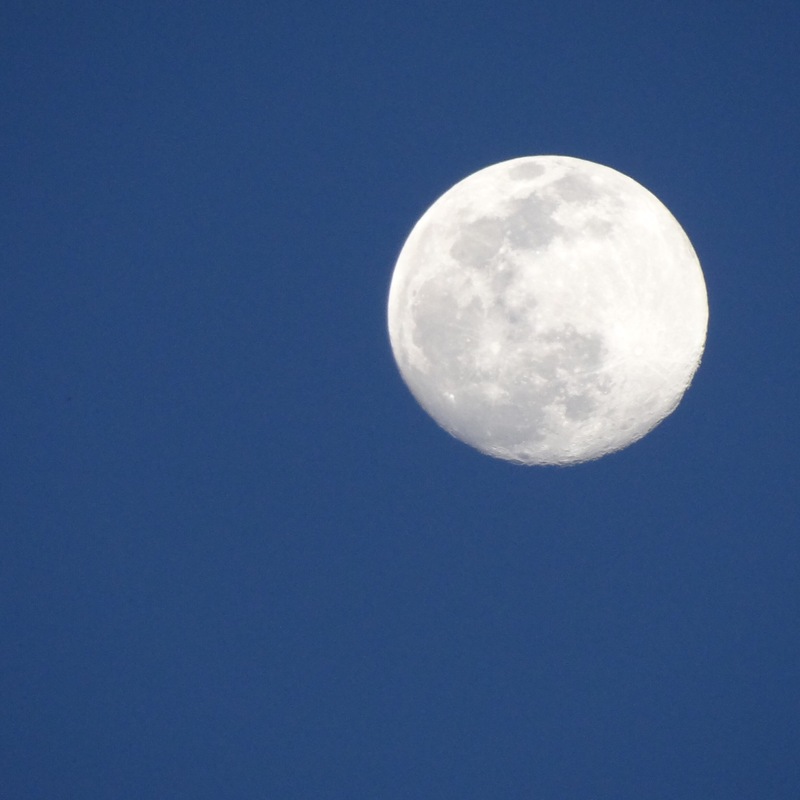 I looked up in the sky to see the largest, brightest, most beautiful full moon I had ever seen. If it does get better than this, I’m looking forward to seeing how. 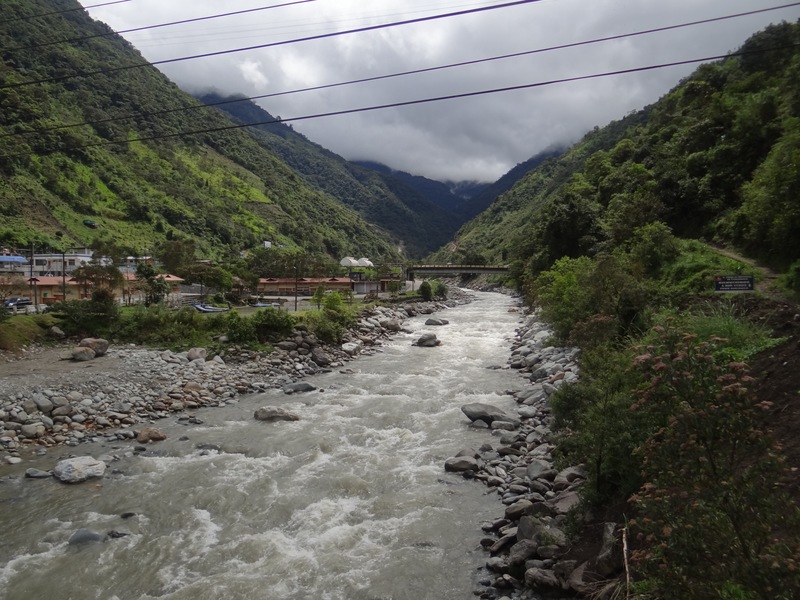 It was raining when I arrived in Baños, but I could see the jungle twisting up on all sides like a cocoon. 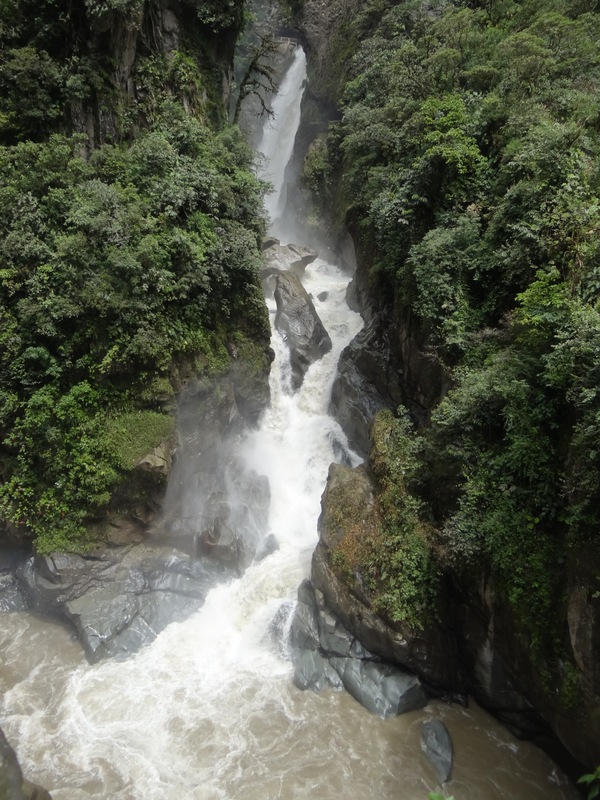 There were tenuous waterfalls cascading down from the cloud forest to the valley below. 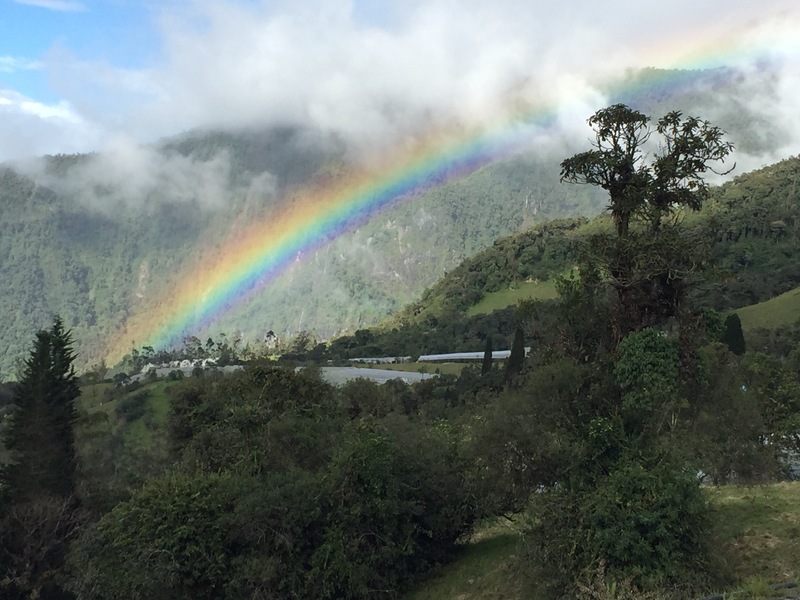 The mist and the fog created a mystical otherworld of rainbows and likely leprechauns. 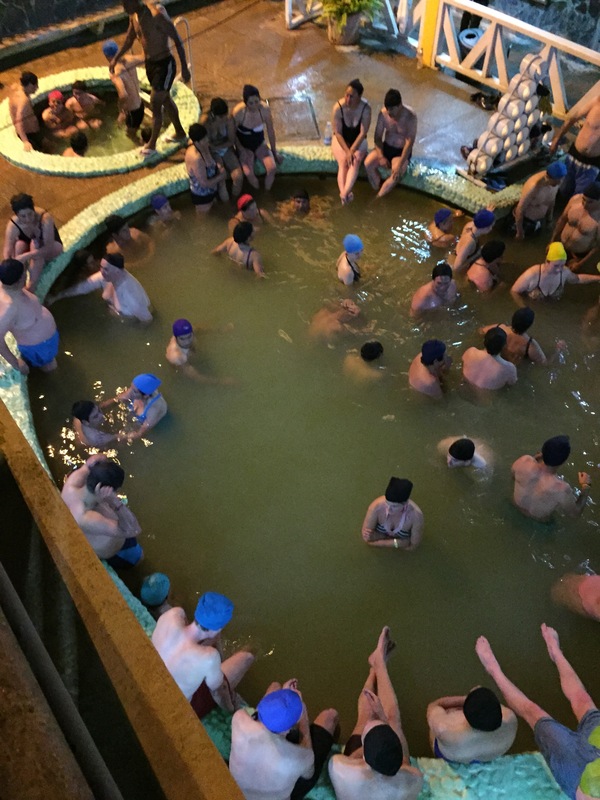 Baños gets its name from the baths, or the thermal pools, that gurgle up from beneath the surface and have been reputed to have healing properties due to the high mineral content in the water. 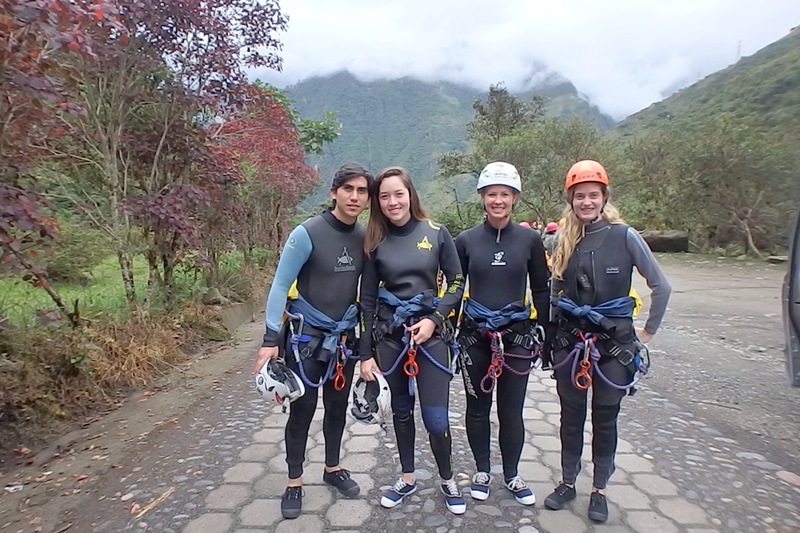 If you’re looking for adventure sports in Ecuador, this is the hub. 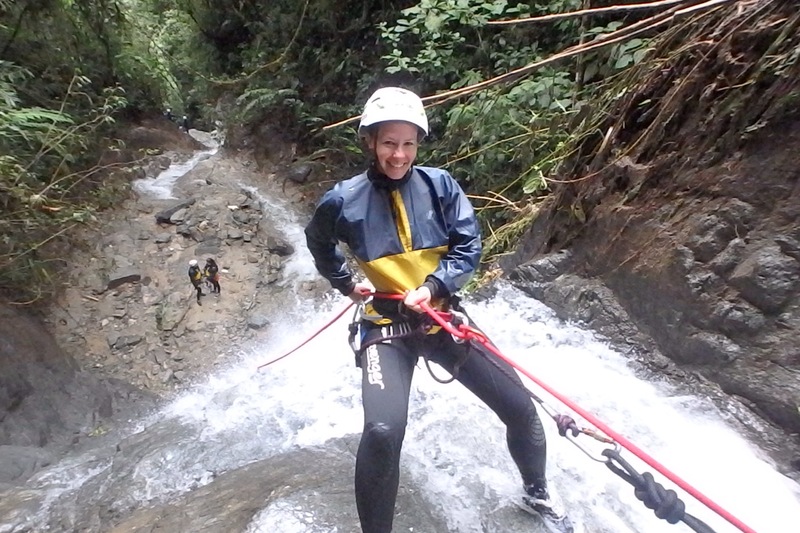 Everything from rafting, kayaking, hang gliding, bridge jumping, horseback riding, biking, hiking, canyoning, and much more can whet any adventurer’s appetite. 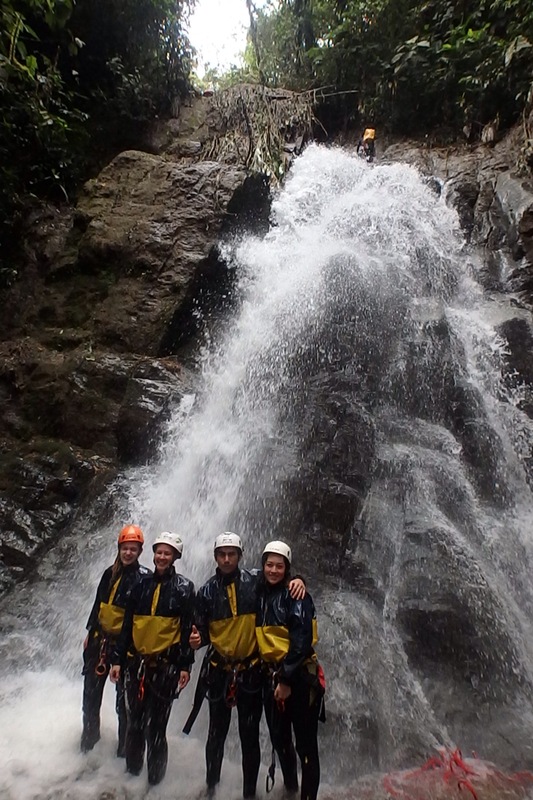 I immediately knew I wanted to try canyoning, which involves rappelling down a waterfall, but first to sample some of the “almost” free activities like any good backpacker should. 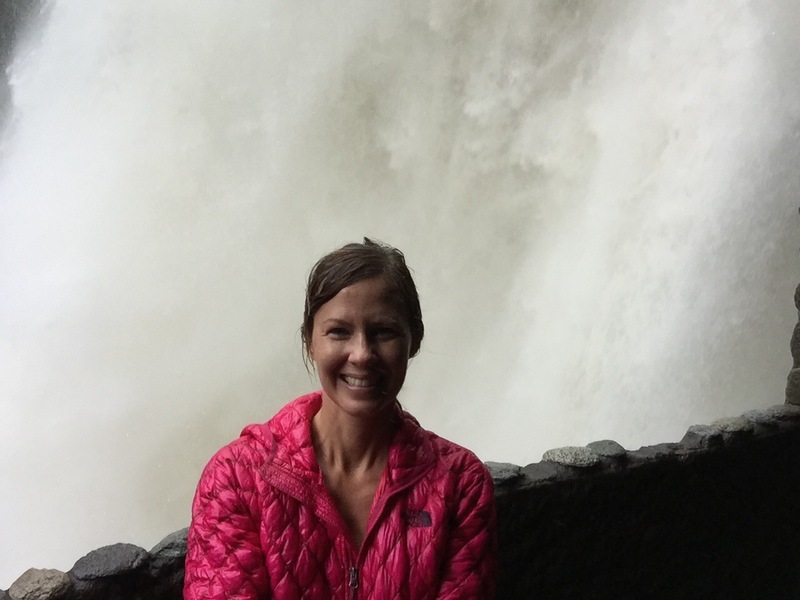 Packing it in, I took a hike to the thundering Pailon del Diablo, or Devil’s Cauldron, where you can get up close (and drenched) to this magnificent beauty. 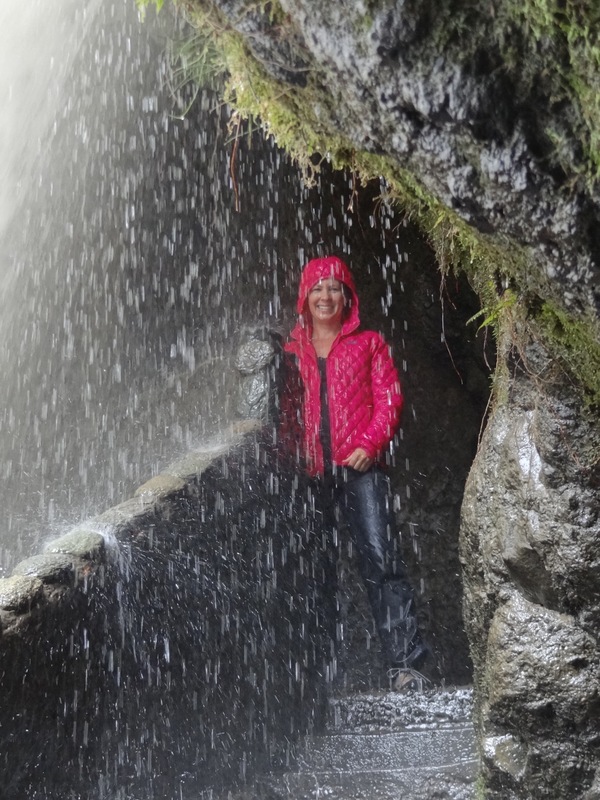 Near the mid-point of the falls, you climb through a series of caves and tunnels to emerge in an absolute shower of ice cold water and can feel the true fury of this monster from behind. 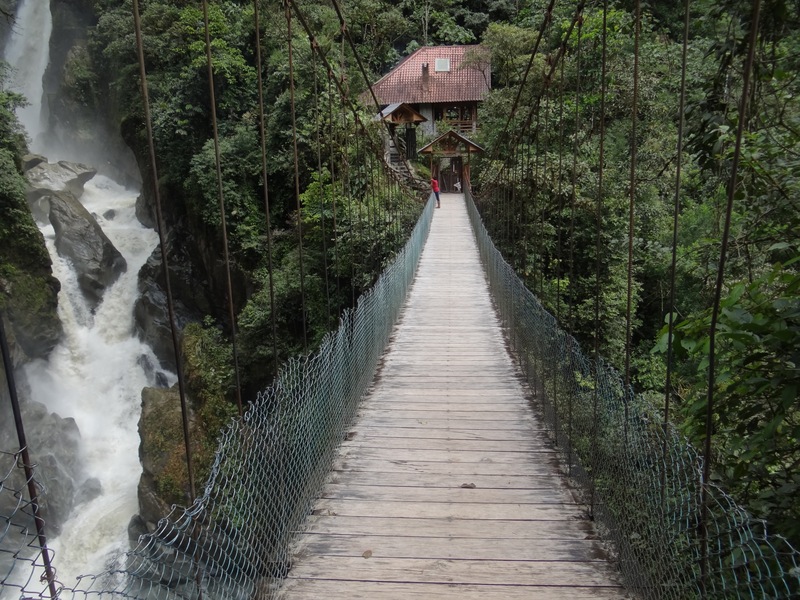 Second up, a trip to the famous Casa del Arbol (tree house) was in order. It costs $2 round trip for the bus ticket and $1 to enter. 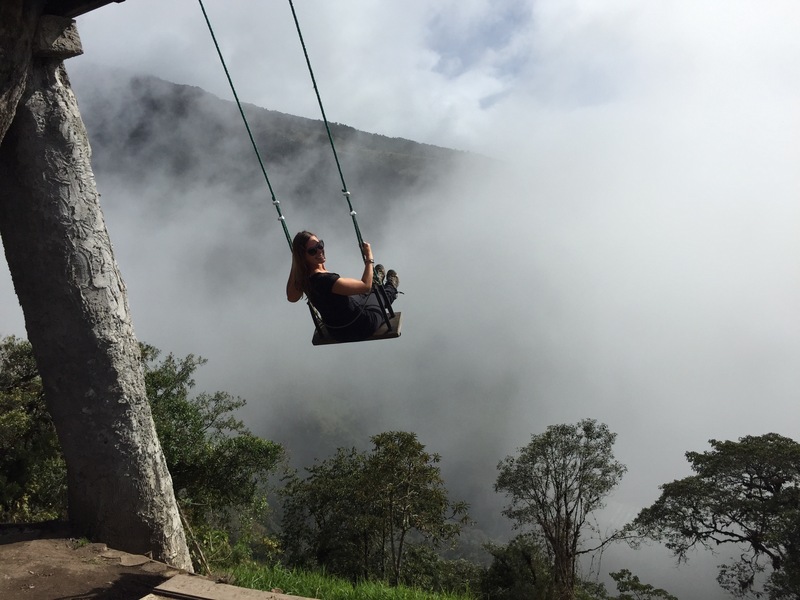 Don’t mistake this for some death-defying swing over the abyss, but for the cost, it was a fun excursion. 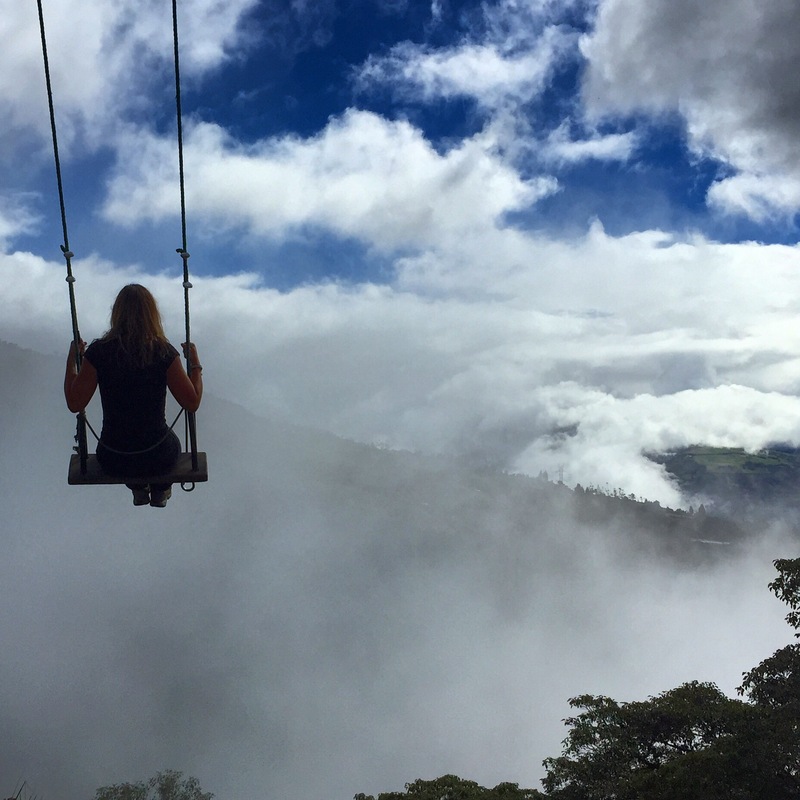 Duel tree swings constructed on the edge of a mountain give the illusion that you sail away into the clouds with an unobstructed view to what lies below. This is also where I met Alan and Emily, English teachers working in Colombia, who made an otherwise boring swing into an amusement park’s worth of laughs. 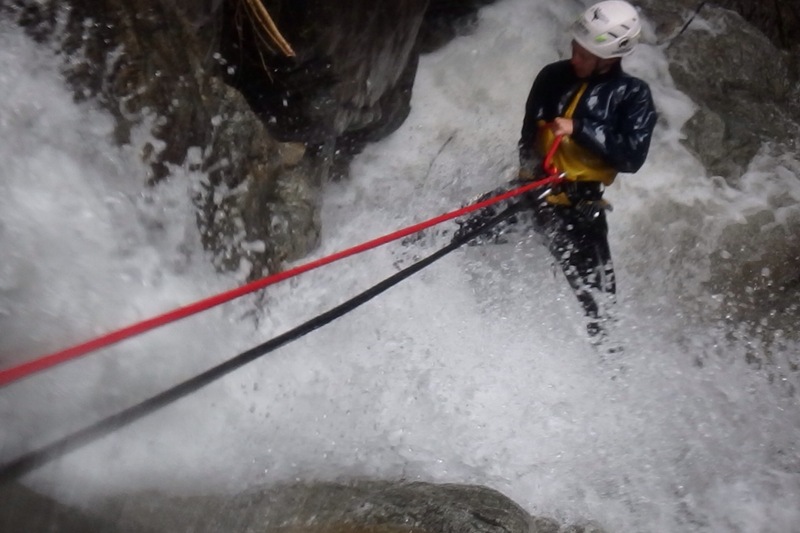 To go canyoning, I wasn’t scared, not even a little bit, but perhaps therein lies the lesson. 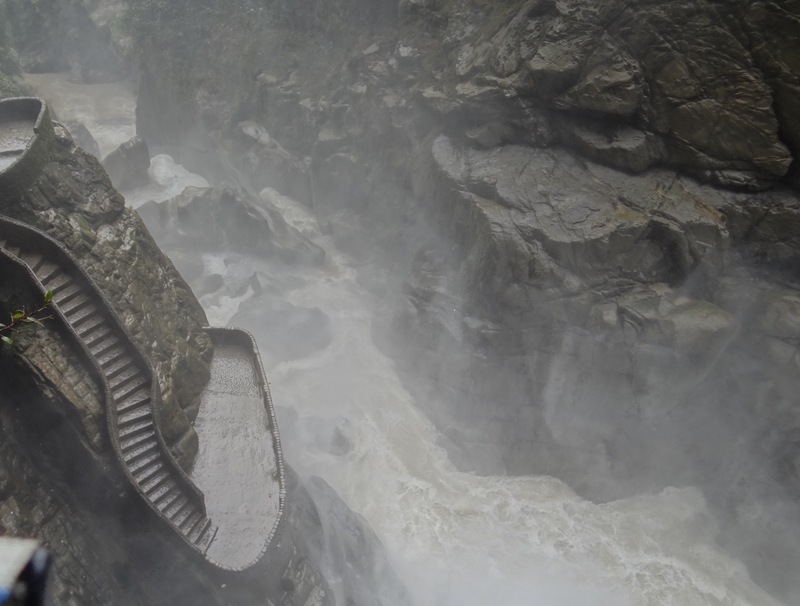 I approached this with complete confidence as if I had been rappelling hundreds of times. 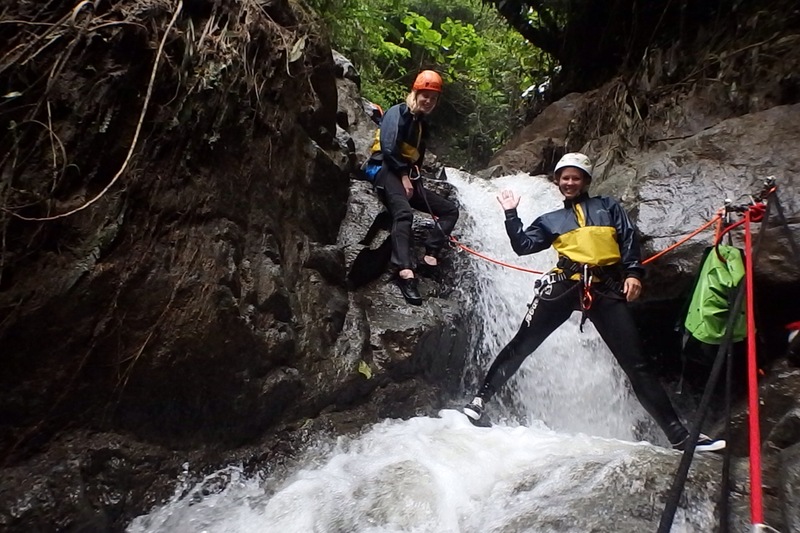 I might have been better served with a healthy dose of reserve because canyoning is not at all what I expected. I thought I am fit and strong enough and this should be easy if I follow instructions and pay attention. 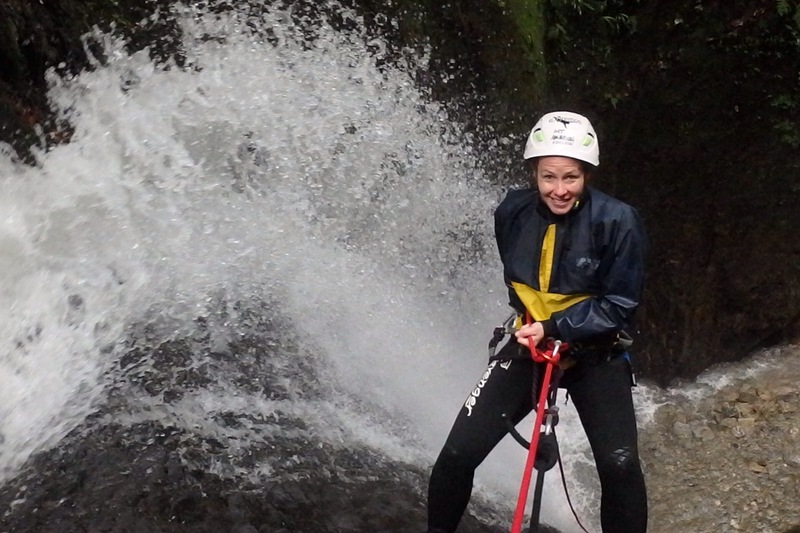 Have you ever tried to defy gravity, backwards, in an awkward half sitting/half reclining position, using a slippery surface as your guide, while buckets of a neverending deluge of potentially dirty water (let’s be honest….this is Ecuador) smack you in the face? Well, try it. Don’t get me wrong, it was really fun and ridiculous, but it was not as easy as it looks and the power of water to bat you about like a fly is simply awe-inspiring. Needless to say, I survived. 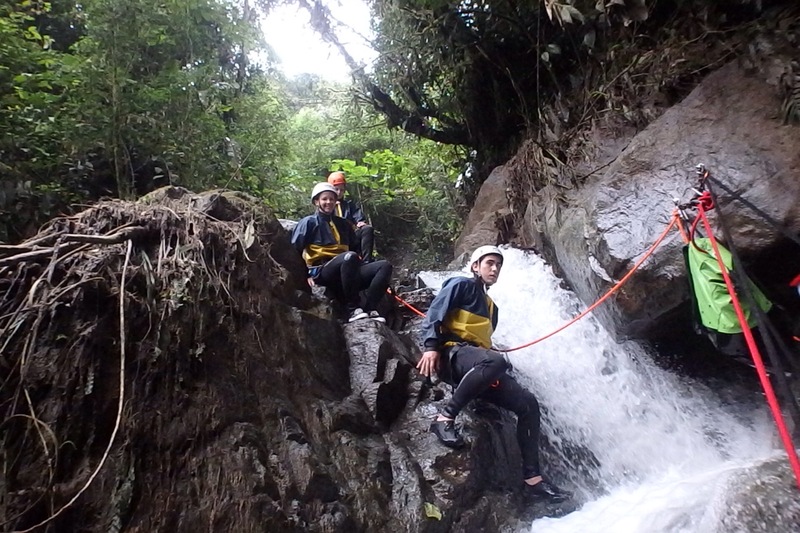 And I am quite keen to try rappelling sometime, but I’ll leave canyoning to the fish.